In this matrix of entrances and exits? This entry was posted in Uncategorized and tagged Refuge on February 26, 2016 by Stephen. First there were two or three of us. Then there were a few more, searching amongst trees in the park. Then there were more than the 13 trees cut down for seismic testing. We were growing in a forest on a mountain, mushrooms or mitochondria. And bear and deer and racoon were with us. Underneath the canopy, the bestiary. A pipe could not be put through predatory or for pretext was our mandate. Question: what is horizontal directional drilling anyway? Answer: depends on how deep you imagine unceded goes—bedrock and beyond? Then there were more than 31 and then there were more than 301. The barricade was made more from people and what transpired between people and more people than it was the junk hauled out of the woods and piled at the borehole. And bear and deer and racoons and ravens. Maybe we were animals coming to the nearness of other animals releasing a social hormone or howl or moan and attracting us and others sensing this and howling or moaning back and joining us. And children and grandmothers and queers and punks. Then there were more and more or really just barely enough in the end which was no end or resolution. Morning under tarps blue light was sublime congress. Evening and ghost cars and drones did not dissuade. Sacred fire. Drumming. I will forever recall walking through yellow wood towards a horizon or object not of this world that is of this world that was passed person to person invisible like solidarity until each person was full of this thing that was tomorrowing when cops and courts and coordinates intervened as systems of public doubt and private accumulation. And yet still we are gathering and burning and drumming. Still animals. Still only beginning. This entry was posted in Uncategorized on January 11, 2016 by Stephen. This poem is an addenda to the dialogue between myself and poet Sean Bonney in Toward. Some. Air. (Banff Press 2015). In 1649 the Diggers occupied enclosed common land on St. George’s Hill, declaring the world “a common treasury for all.” Today the site is occupied by a golf course and some of the most exclusive and expensive residential property in the world. would they not talk thus and thus? This entry was posted in Uncategorized and tagged commons, Diggers, poetry on January 9, 2016 by Stephen. No liveable life for anyone. I’m getting ahead of myself. Or maybe behind the times. Their full and terrible extent. By the capitalist and colonial era. Alternative on the table now. In this no alternative sense. Fashioning new forms of justice there? Relationship to the natural environment. Gets to say and claim it? How fucked up is that? Displacement of peoples this planet over. Make and breathe together in struggle. This entry was posted in Uncategorized and tagged climate justice on October 18, 2015 by Stephen. Our argument tonight, stated as simply as possible, is this: If what Lynne and I have done constitutes anything “controversial,” it is so only because of the problematic state of our current democracy, for all we have done, in our opinion, is exercise “normal” and supposedly long-standing democratic rights of assembly and public speech. Democracy, now, produces a fundamental contradiction which anyone engaging in the political must wrestle with: we feel we cannot help but participate in the current democratic system (there are so many urgent issues to address)—voting, supporting parties and candidates, participating in public debate, even running for office—at the same time, we can have little faith in the ability of our political system, as currently constituted, when it comes to the most pressing issues we face (such as climate change, the geographical displacement of populations, and Indigenous rights and land claims), and so we must also take direct action outside of the electoral and representative apparatus of governance. To live today is to live in a world of such contradictions. Go vote on Monday, but do not stop there, and do not stop demanding, and taking steps to build, a more just, more open, more equal and more participatory political system. Another way of approaching this: controversy, however figured—along with informed, respectful argument and passionate disagreement, as well as acts that can be seen as confrontational or disruptive, acts which sometimes may involve non-violent civil disobedience—should really be understood as part of the healthy functioning of a democracy. They are evidence of the people taking autonomous control of and responsibility for their lives. If such acts themselves come to be characterized as “controversial,” rather than essential, then something is rotten in the state of our democracy. Our discussion tonight of what, exactly, might be “controversial” about direct democratic action will pass through the lenses of our personal stories this past year, the particularity of our fields of research, and the critique we are levelling with our words and our actions. 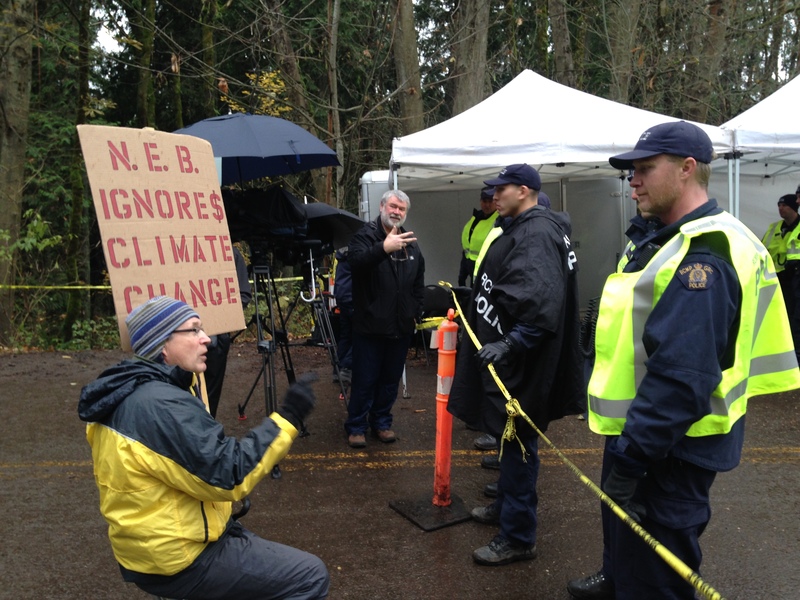 For me, my involvement in the Kinder Morgan resistance this past year was unavoidable. I had for a number of years been writing about and participating in social justice and environmental justice grassroots movements. I had been concerned about climate change, social inequality, Indigenous land claims, and our government’s seeming inability, or lack of interest in, doing anything about these issues. 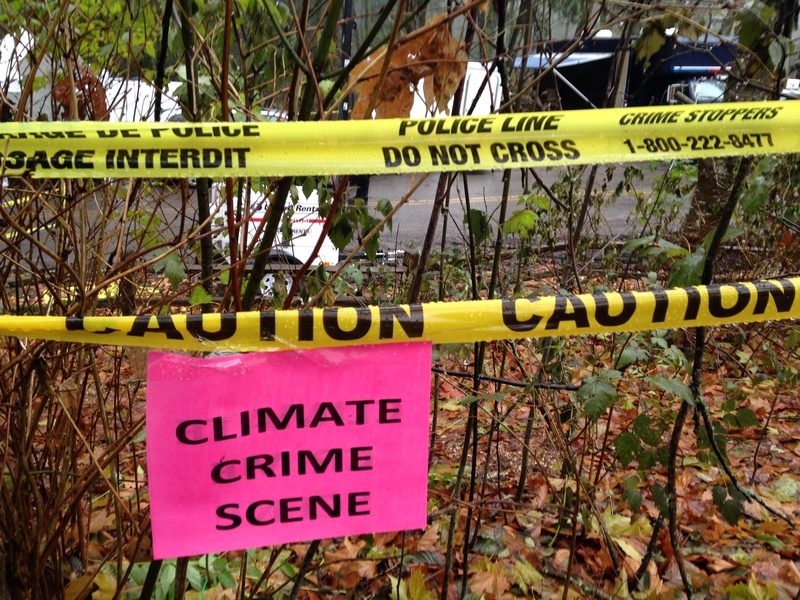 When Kinder Morgan came to the Burnaby Mountain Conservation Area, to cut trees and conduct seismic testing for their new pipeline last September, they came into my back yard. I have a 20-year relationship with Simon Fraser University, so this mountain is one of my homes, a place where I have spent a good portion of my life, and I care about it, as a place and as a community. I care about local First Nations title to this land upon which I am a settler. And I care about the state of this world, the natural environment upon which we all collectively depend, and the future my and your children and grandchildren and great grandchildren will inherit. “Kinder Morgan,” it may be worth noting, in perhaps not the best German translation, can be taken to mean “tomorrow’s children.” This accident in corporate naming is telling. I could, on my way to and from work, stop on the mountain and join others keeping watch in the forest. I could, and soon did, play the role of a spokesperson for what people were trying to achieve on the mountain. And I could write—and I did write—as Lynne did too. For me personally, one of the most instructive, and chilling, moments was having my writing read aloud in the BC Supreme Court, by Kinder Morgan’s lawyers, accusing me of conspiring against their company. “Underneath the poetry,” the lawyer said of a blog I had written (and I quote), “is a description of how the barricade was made”—thereby unintentionally echoing the famous Situationist slogan: sous la plave, la plage (under the paving stones, the beach). It was a good day for poetry—it mattered enough to be cited in court—even if it was a bad day for this one poet. That one sentence spoken by that lawyer on November 5 2014 continues to haunt and shape my work (including my forthcoming book of poetry, Once in Blockadia). Of course, I’ve always mostly been interested in what was “beneath the poetry”—the Real, the material world of exploitation and repression, and collective struggles for justice and freedom and our complicated social relations. But now that the two-headed monster of the corporate state has tipped its hat—that it, too, is very interested in what’s “beneath the poetry,” and the sort of veiling that literary and other cultural expressions may engage in—well, quite simply I’m still trying to process this new piece of information. The connection between poetry and politics, poetry and social justice and social movements, is primary to the work I do in my academic field. In a recent publication I referred to the sort of work I do as a form of “embedded poetry”—like an “embedded” journalist, I write from a position within groups undertaking certain actions in the social field. Obviously this is anything but dispassionate, distanced or objective research; it is a committed creative and critical practice. But the literature that doubles as social commentary and in fact at times as a form of social “action” also has a long tradition about which I teach and write, as well as engaging in it in my own creative practice. This is what I find so useful and fascinating—both as a subject I study and a methodology I employ: poetry, especially, provides the generic wherewithal to imagine ourselves as vocal agents of change and actors on the stage of social transformation. Poetry is still shaped by speech and the oral imaginary. In a poem, we can say public things we otherwise do not have the opportunity or occasion (or perhaps even freedom) to say, and we can address situations, individuals, the body politic and even abstract entities in ways that would not otherwise make sense. And yet, this imaginary by which we speak to that which it is often impossible to speak is a crucial political imaginary too. Democracy, I would argue, is nothing less than a mechanism to allow impossible speech: the collective speech of and between communities, the speech of and to large and abstract forces that affect us all in the broadest, and therefore sometimes decidedly intangible, ways. Such speech is absolutely necessary to our social wellbeing, and while “publicness” seems to be something which has been steadily eroded over the past three or four neoliberal and austerity filled decades, poetry and other literary arts remain a place where the voice of honest indignation (as William Blake called it) is kept alive. Multivariate analysis indicates that economic elites and organised groups representing business interests have substantial independent impacts on US government policy, while average citizens and mass-based interest groups have little or no independent influence. This is likely news to no one. Consider Bill C-51, a piece of legislation which the majority of legal experts in Canada deride as unconstitutional and, frankly, undemocratic. Consider the “close working relationship” between the current Conservative government of Canada and its “friends” in the fossil fuel industry—to the point at which, as documents have revealed, the government has over the past four years implemented exactly those policy and regulatory changes industry has asked for—down to each dotted i and crossed t. Then of course there is the denial of the will of the city and the majority of the citizens of Burnaby in the Kinder Morgan case on Burnaby Mountain, and the way various levels of government run roughshod over Indigenous rights and title in the rush to approve and develop multi-national fossil fuel extraction, infrastructure and trade deals. I could of course go on. But consider this: a recent Fraser Institute report suggests that “democratic institutions are not relevant for an enhanced feeling of life control.” The report adds that economic freedom, specifically, “exerts a positive impact on life satisfaction, while democracy remains insignificant.” Here’s where we are heading under the current neoliberal phase of capitalism and governmentality: democracy is “insignificant”; you can find “life control” and “life satisfaction” through economic (as opposed here to social) freedom alone. Interesting. And who, we might ask, has access to this singularly significant “economic freedom”? Hmm…I wonder. Let’s step back from the brink of democracy’s twilit last gleaming. The era in which modern democratic institutions developed, over the past two to three centuries, is also the era of capitalism’s full and eventually global development. It is also the era of colonialism—if we stretch this analysis back just slightly into the seventeenth century, when the British parliament, at least, began to exert more power, and in which global exploration and expropriation began to expand beyond Europe in earnest. All these socio-historical phenomena—capitalism, colonialism, and what we have come to refer to as “democracy”—are linked processes. They are phenomena unleashed by the drive of elites to increase their influence and wealth—and thus productive forces—supported by a rapidly developing ideology of limitless economic growth and competition—through the private ownership of land and labouring bodies (sometimes the bodies themselves, literally, at other times simply the labour time of those bodies—although it has often amounted to the same thing). In the historical narrative I’m offering here, democracy—the “granting” of democratic rights and the gradual implementation of a slowly expanded franchise—functions as a “containment system,” intended to corral popular will and opinion—to cordon it off while the important business of colonization and capital accumulation proceeded and expanded (as indeed it continues to proceed and expand, in diverse ways). We might say that the rights and freedoms we do have were “granted” only because of popular unrest and resistance: the commons demanded change, and elites gradually offered various sops and allowances and “privileges” which were eventually stitched into a system (which we have deigned to call democracy), constantly modified, which allowed a semblance of the participation of the “will of the people” while continuing to serve the interests of the accumulation and radically uneven distribution of wealth. So—maybe there’s something more important here that the word “democracy” obscures. Maybe what we really need to focus on is the demos, the commons, and the ability of the commons to manage and maintain its shared planetary resources. This is the controversial thing Lynne, and myself, and many others did: we stood on the remnant commons of public space and unceded territory and demanded that the commons be heard, be acknowledged, and be followed. I return to the question of controversy. Is it really controversial to act to protect our shared natural environment? Is it really controversial to place ecological values ahead of economic ones, or to demand economic practices that are in harmony with ecological values? IF it is, then we are truly in a bad way. And certainly legislation such as Bill C-51 attempts to mark out those who stand in the path of the economic’s triumphant parade over the body of the ecological—especially Indigenous land defenders—as controversial, deviant, even terrorists. If Lynne and I have indeed participated in a controversy, it is largely, to my mind, a controversy centered on one aspect of our work as academics. It is not our research that is necessarily controversial, nor is it our teaching. Rather, it is our public outreach and service to the wider community—our functioning as “public intellectuals” (if such beasts are not yet extinct), and our taking of SFU’s mantra—engaging the world—perhaps a little more literally than intended. Advocacy is often a part of what academics do, both from within and outside their respective fields. You might also characterise what Lynne and I have done as to take our social analysis and critique—our understandings of the functioning of the physical and social worlds—and put them at the service not just of our disciplinary community, but at the service of the wider community as well. This is perhaps another form of “embedded” cultural practice—embedding knowledge production and dissemination not in the rarefied and disciplinarily bound institution alone, but in the very communities that are struggling for social change from below—and further, to actually form that knowledge in a collaborative and grassroots milieu. We have without question desired to be of service. But again I have to ask, what here is controversial or even exceptional? In the kind of political life that I would see as living up to the concept of democracy—of real, participatory democracy—such “engagement,” such direct collective social action, would neither be controversial nor extraordinary. It would be expected. It would be a normal part of daily life—and indeed we would have to reconceive daily life so that it allowed and supported a more fulsome participation in a more autonomous, localized, and engaged form of community self-governance (a topic of discussion, perhaps, to reserve for another occasion). Now imagine—if engaging the world was taken to mean direct and active participation in our own collective self-governance, as well as the attendant ascendancy of the rights and responsibilities of citizens over corporations, we might have to redefine engagement—we might in fact have to rebrand SFU as having a new, more radical mandate—one of revolutionizing the world. This entry was posted in Uncategorized and tagged commons, Democracy, Kinder Morgan on October 14, 2015 by Stephen. We are faculty members who strongly object to the Administration’s threat to end the health benefits for TSSU members. As we understand it, this will include terminating Medical (MSP), Extended Health (EBH) and Dental benefits for all those now receiving them, or will require that the employees themselves pay these premiums if they are to be covered. This move directly threatens the health and well-being of TSSU members and their families, and is therefore a very harsh imposition on professional workers at SFU who are already in precarious working conditions. While we understand that this may be legal because the contract has expired, it also constitutes a tremendous abuse of power during contract negotiations. We would urge the Administration to rethink its position and return to bargaining with TSSU. This entry was posted in Uncategorized on October 9, 2015 by Stephen. or what it looks like? This entry was posted in Uncategorized on October 2, 2015 by Stephen. In the name of what are we going to resist?